I’m thankful for autumn and fall. For churros. 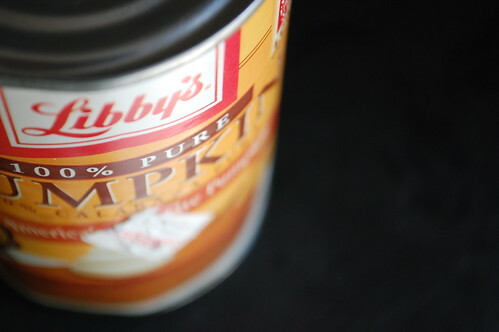 For pumpkin puree. For pumpkin churros. For sugar, and chocolate and spice. For taste notes called toffee and caramel. For New England autumns, for deep-fried. Dough. I’m thankful for new beginnings, for children that love freely, for hope, for joy. For life. And the occasional wave of pain. I’m thankful for homecomings, imperfect as they sometimes are. The cracks are beginning to show. Sandwiches come back in lunch boxes. Barely touched. All my enquires yield is ‘I prefer the nutella in Holland’. Daughter #2. The son quips in ‘I miss Ethan. Not the brown one but the white one’. He’s met an Ethan here but their first meeting ends in a fight, with tiny punches exchanged. And little Miss, Daughter #1 finishes this tale of ‘missing Holland’ with ‘Can we go to Holland this holiday? I miss my friends’. My response is ‘Holland? This winter? No way. All I can think about is the gorgeous snowscapes but the freezing cold and ice and snow which would paralyse me and keep me indoors – I’m not quite ready to trade my tropical warmth. But I understand their thoughts. And words. Because so much is new and exciting and terrifying and unknown and amazing, worthy to be embraced but new still here, that they, we….want to run away to all that’s old and known and thus, comforting. I could write an epistle and I think I will. I’ll call it ‘The Reluctant Repat’, and it will have a happy ending. Like all fairytales do. And so when I stand in my west-facing kitchen close to the equator, stirring up a batch of choux pastry and the smell is the exact same…..warm and buttery as it was in the Netherlands; I am transported to a certain open kitchen where these same feet were planted merely weeks ago, six thousand, five hundred and twenty eight kilometers away, as the crow flies. Everything is almost the same – the sweat and elbow grease…making sure the beaten eggs don’t scramble in the warm, cooked dough; the excitement of my children with chants of ‘churros, churros, churros’. All the while I’m thinking, ‘Do I know where my churrera is?’ But everything is not the same. The heat is something else here. And the squawking of the birds to the mechanical hum and throb of a generator are new sounds to me. My head can’t stay quiet to think thoughts. All my thinking is punctuated with the noise around me that I cannot ignore. 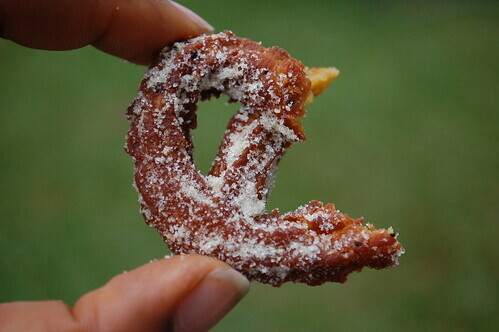 Half eaten ‘pretzel’ churro…or churro pretzel…. 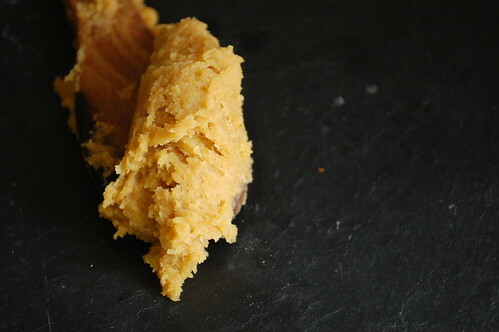 I broach the subject of ‘pumpkin churros’ to my tribe. They are adamant that they want ‘no part’ in it. They’ve never been fans of pumpkin soup or anything else with that bright orange squash and so I make a regular batch of churros and a pumpkin batch. And I live to tell a happy tale….because when the regular was all eaten and gone and the pumpkin reared its head….history was made. To quote one child ‘I love this churros better than the other one’. I push her to tell me more but she says ‘I don’t know, they’re just better’. And demands them for breakfast. I oblige. And that’s the truth about this churros. They have a certain ‘je ne sais quoi’ quality to them. Something fleeting, a whispered secret, a gentle caress, a refreshing cool breeze on a hot summer’s day. Do you like this photo? I’m twifling….cause I used my flash. What do you think? When I began the journey of thanksgiving on Sunday with these churros, my kitchen smelled of goodness, pure and unadulterated. It embraced all that is good and right about life – peace, warmth, joy, unity and spice. And love. For without love…and faith, who are we. What are we but shells of our beings? I sneak a tiny taste and it has all the orange hues, copper tones and gorgeous russets of a New England Autumn. Of an orange leaf mountain. It eats like a warm, tartan blanket and a bowl of soup on a cold fall evening. It was and is full of thanksgiving. And perfect with melted chocolate. 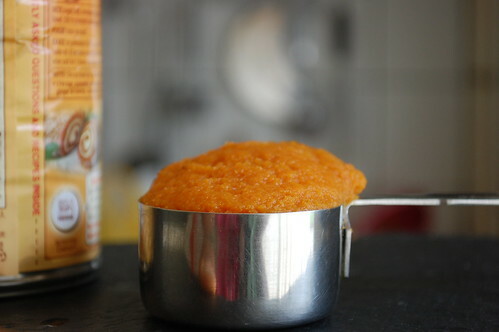 Combine water, pumpkin puree, butter, salt, and sugar in a saucepan. Stir so the pumpkin puree mixes with the water. 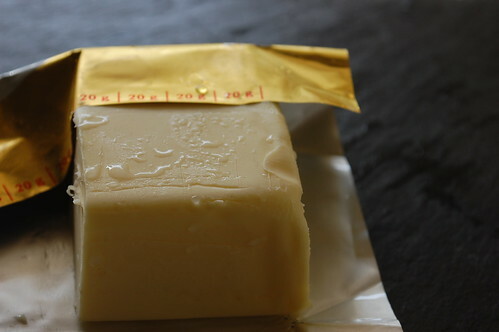 Melt the butter without stirring. 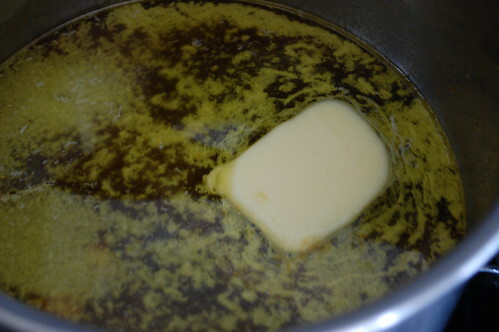 If you notice bubbles forming, remove the saucepan from the heat, letting the butter melt with the residual heat, then return to the heat till the butter is melted. Bring to the boil – at this point, you should begin to smell the golden goodness of the butter. Once it boils, remove from the heat and add all the flour to the pan in one go. 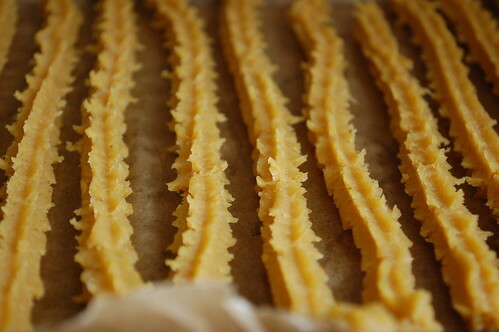 Stir slowly but continuously with a wooden spoon to combine. Place mixture back on heat and stir until the batter releases from the sides, approximately one to two minutes. The resulting dough should be smooth and translucent with a ‘cooked’ mashed potato look about it. Let cool for about 10 minutes before proceeding to the next step of adding the eggs otherwise the eggs will ‘cook’ on contact with the hot dough. If you don’t want to do the next bit by hand, put the cooked paste into your mixer on low speed and then add the eggs. Let mix till incorporated. Otherwise, do this by hand and add the eggs, then using all the effort you can (elbow grease), turn the wooden spoon round with circular motions, till the eggs are incorporated. Put the batter in the churrera or a large piping bag fitted with a star nozzle (and fill ¾ of the way full). I pipe my batter on cookie sheets lines with grease-proof as I usually make a batch to freeze. 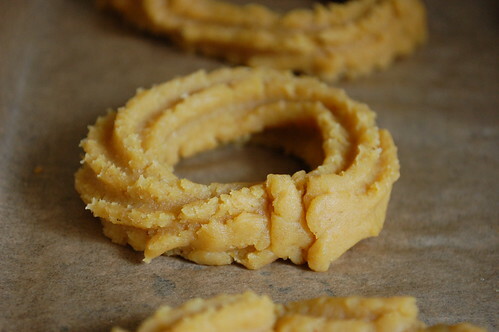 This time I piped them in rings to make ‘donuts’…. and lengths which reminded me of christmas trees. I made ‘pretzels’ which wowed the kids at the breakfast table. Preheat a pan with about 3-4 inches of oil or use your deep fryer and set the temperature to 170°C (about 350°F). 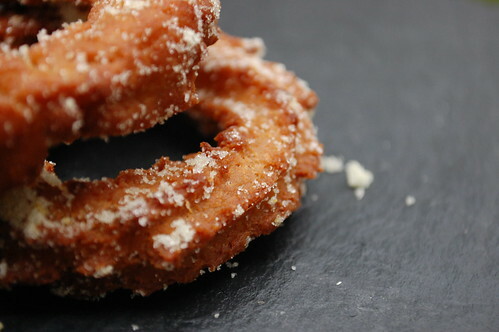 When hot (and a tiny piece of churros thrown in bubbles up within 10 seconds), put the piped batter into the pan. Fill the pan without crowding it so the churros have room to breathe. Once they start to brown, turn each one and fry until golden brown, about 3 to 4 minutes. Remove from heat once golden. 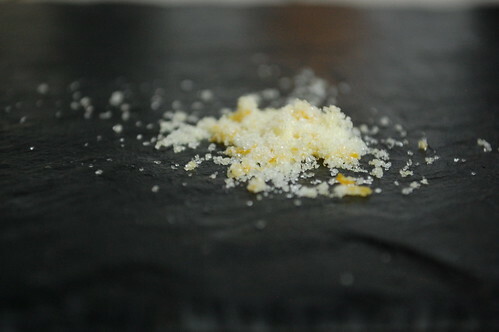 Then toss the churros in any of the flavoured sugars. Serve, with extra bowls of sugars on the side. 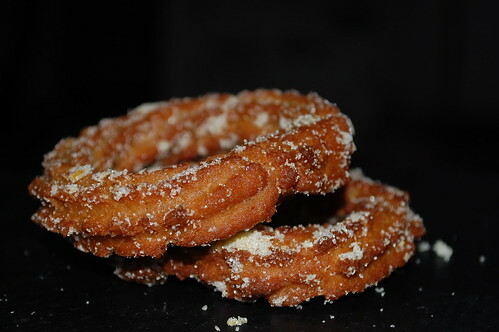 See my original churros post for tips on making flavoured sugars and melted chocolate to accompany the churros. Happy and Blessed Thanksgiving dear friends. I am thankful for your love and readership, friendships and ideas. Inspiration and kindness. Thank you.